LOM’s 6,500sqm new build staff academy for Tesco, the British multinational grocery retailer, will start to take on its distinctive oval shape, on Thursday 10 August 2017, as the 28 metre laminated timber beams, arrive on site. The academy, collaboration, well-being and experience centre designed by LOM, currently being constructed by McLaren, will create a new heart to Tesco’s head office campus in Hertfordshire. 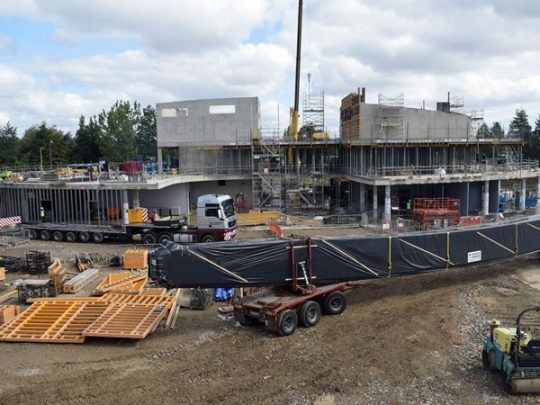 The glulam beams are environmentally certified by the PEFC ensuring that they a manufactured using sustainable forest managed timber and will be delivered overnight to avoid traffic, and causing an obstruction. Watch the images from the on site camera.